Hixson opened its homecoming game Friday by shoving the ball down Red Bank’s throat, driving to the Lions’ 31 on 11 plays. The 12th play, however, turned the game upside down. Red Bank senior safety Tyler Jones intercepted a Landon Wallace pass and returned it 88 electrifying yards for a touchdown and a quick 7-0 lead. Jones now has two interceptions, snatching his first one against Signal Mountain. “That was our first touchdown tonight and I knew momentum was on our side after that,” he said. Hixson lost its early energy, Red Bank was suddenly uplifted and used Jones’ explosive pick-six as motivation and eventually routed the Wildcats, 42-7, at Anthony S. Martino Field. “Hixson has been consistently moving the ball on people and they moved it right down the field on us,” Red Bank’s first year head coach Chris Brown said. “It was a huge interception and a big momentum lift for us. Lions quarterback Madox Wilkey threw touchdown passes to three different players, hitting Calvin Jackson on a 5-yarder, Lumiere Strickland on a 65-yard hookup and a 59-yard strike to Michael Porter. Wilkey went 8 for 12 with 196 yards and three touchdowns as the trigger to Red Bank’s offense, which has put up 142 points while the stingy defense has allowed only 47. He has thrown for 625 yards and six touchdowns through four games. Jackson, who missed the season’s first two games with an injury, also had TD runs of 5 and 3 yards. All the scoring came in the first and the entire second half was played with a running clock. “We played great tonight,” said Wilkey, whose older brother, Hagen, also played quarterback for the Lions. “The guys up front blocked for us and protected us and we had one guy (Ryan Pate) out but a couple of sophomore stepped up. Having won four straight games matches Red Bank’s 4-0 start in 2011, but the Lions would love to duplicate get-away seasons like 2006, 2007 and 2009. In all three seasons, the Lions won 12 straight before losing in the playoffs, one in the second round and twice in the quarterfinals. While the Lions, beating Hixson for the second straight time, are enjoying a stunning start of their season, the Wildcats fell to 0-5 and have been outscored 222-42. Once Jones made his spectacular interception and return, they Lions didn’t waste much time putting the Wildcats in a hole they couldn’t escape. Red Bank’s scoring came quick and often. The two teams exchanged punts, and Red Bank got another break when Eli Massengale recovered a fumble punt at Hixson’s 39. Five plays later, Wilkey hit Jackson on a 5-yard TD pass with 41.6 seconds left in the first quarter. Hixson’s senior running back Tre Warthan fumbled after a nice gain and Red Bank’s Jaden High smothered the ball at the Wildcats’ 46. Following a penalty that set up a second-and-21, Wilkey threw a short strike to Strickland, who raced down the sideline on a 65-yard TD, pushing the Lions’ lead to 21-0 with 10:50 left in the second quarter. Hixson took the ensuing kickoff and steadily drove 67 yards to Red Bank’s 7 in five plays, from where Landon Wallace scored with 8:01 on the clock. The possession started in weird fashion. The kickoff hit a Wildcat returner in the helmet and Maurice Carter grabbed the ball in full stride and returned to the Hixson 26. The Wildcats’ emotional lift lasted all of 46 seconds. Wilkey connected with Strickland on a 59-yard TD play and the Lions regained their 21-point advantage. Red Bank’s defense again came through with Latrell Adair picking up a fumble at the Hixson 7. After an incompletion in the end zone, Jackson zipped into the end zone, pushing the Lions’ lead to 35-7 with 6:59 showing. Hixson was forced to punt again Porter turned in a brilliant return to the Wildcats’ 19. Four rushing plays later, Jackson darted into paydirt from the 3 and Red Bank went to the locker room with a 35-point advantage. With the mercy rule in effect, neither team scored in the second half. Red Bank reached the Hixson 34, but reserve running back DeAngelo Ross fumbled and Hixson’s Devotis McCurdy recovered early in the fourth quarter. Brown, who came to Red Bank after serving as an assistant coach at Ooltewah and Cleveland, is obviously thrilled with the great start to this season, but there is room for improvement. “We had a lot of players that are known in the area returning, but people don’t realize how young we are,” he said. “We started four sophomores in the offensive line tonight, none of whom are returning starters. Every game they play is a game’s worth of experience. At one point, we have seven sophomores on the field. We’re playing a lot of 15- and 16-year-old kids, so this start is huge. Dating to 2001, Red Bank leads the long-time series, 9-6. 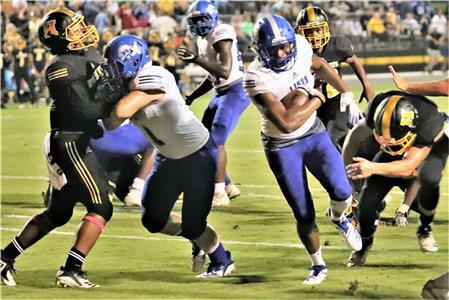 Calvin Jackson, who missed the season's first two games with an injury, has come out the gate strong and scored three touchdowns Friday night as Red Bank thumped Hixson, 42-7. Jackson caught a 5-yard TD pass and added two scores on runs of 5 and 3 yards.